Sorry you haven’t had much new to read here lately. 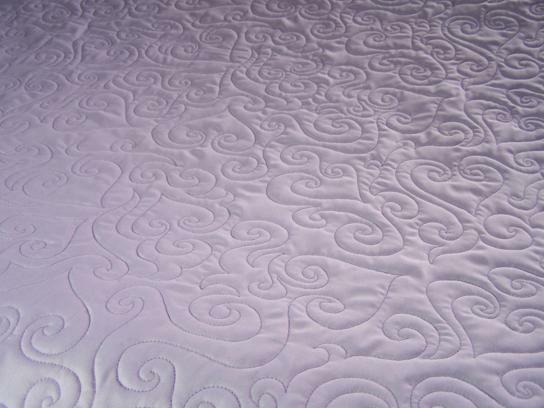 I’m spending most of my spare time getting my customer tops quilted. I finished up both OSU lap quilts, and yesterday, I finished up what felt like 100 miles of Cutie Patootie panto. It is a cutie, but boy was I tired of it by the time I got this one off the machine. 107″ long, 80 something wide. I was Patootie’d out. This is a printed panel top. I must say, the quilting totally changed the look of it. I think my customer will like it. I really like the way it looks on the back. I loaded it with the 107″ length going the length of the table. I thought I would be able to make a whole pass on one bobbin. Wrong reindeer! I wanted the stops & starts to look really good on the back, so I took the extra time to tie off & bury. Today, I am working on my log cabin blocks, for the commissioned quilt I’m doing. Of course, I’m watching the NASCAR race at Bristol while I’m doing that. 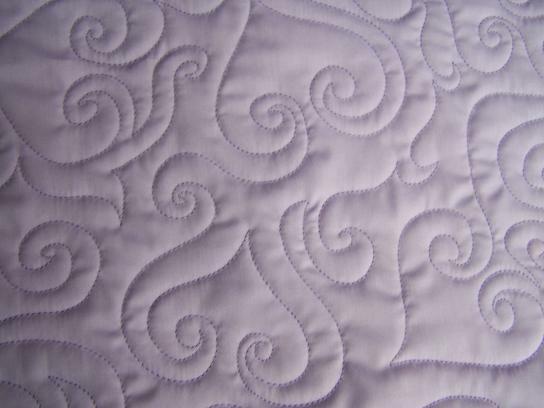 The next project on the longarm will be to finish the borders on my friend’s quilt, if she has her binding removed. If not, and it’s going to be a while, I will go ahead and load the king size custom top I have waiting. I don’t have it scheduled to start til next weekend, so if I can get those borders done first, that would be great. I’m looking forward to getting started on that king, though. I think I’m going to enjoy working on it. Sunday weigh in is back. What was I last time…144, I think. Well, I was pleasantly surprised today. I have not been keeping up with the diet & exercise very well, for at least two weeks. I figured I had gained at least 3 lbs. back, and was happy to see it was only 1! I was 145 today. I must get back on track with this. Hopefully, I will do better this week. I’ve had some comments from others that no way would they post it publicly. I find that doing so really helps me to stay on track. I feel more accountable. And knowing all y’all know encourages me even more to not want to fail. 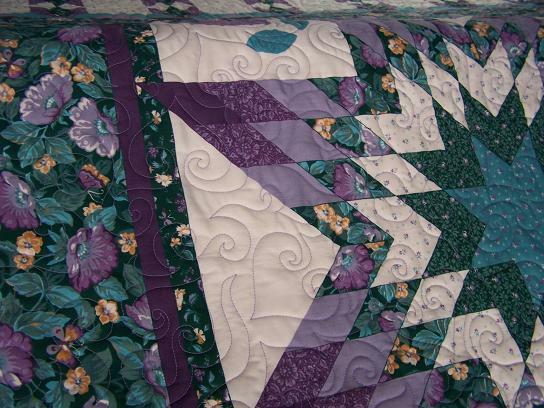 I hope everyone had a great National Quilting Day yesterday. I better get back to sewing. The sooner I get done with these projects, the sooner I can get back to working on my own projects, and making progress with my stash busting! Oh darn! Bobby Labonte just got caught up in someone else’s wreck. Crap! Sorry about Bobby Randi, but at Bristol who knows what is going to happen. Your quilt is really a cutie patootie and I love, love, love, your new header. That’s a lot of patootie! Very pretty though! Such a cute panto, but I get bored pretty easily. You executed it beautifully! Very cute, but alot to do. Love the new header pic! I like the design you used (missed you while you’ve been quiet and busy). 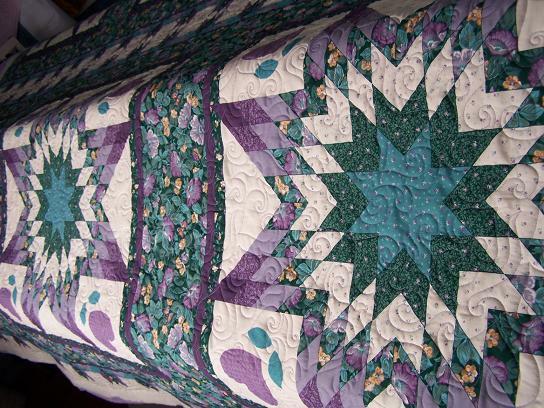 Your customer quilts look great! Love your new header too. That is such a beautiful quilt. Wow! That is the nicest looking panel quilt I have seen! Good to see you are so busy………..